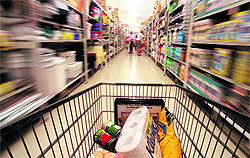 After taking a calculated plunge by unleashing a fresh dose of economic reforms in the country, the Congress-led UPA government has decided to go on the offensive and take up the issue, especially of foreign direct investment in multi-brand retail, directly with the people while attempting to build bridges with the Opposition in Parliament. Robert Vadra today slammed Team Kejriwal for levelling “baseless allegations” to malign him and his family and “gain cheap publicity” ahead of floating a political party. The Centre and the Punjab Police want to put an end to speculations about the “revival of militancy” in Punjab. An extensive fund raising campaign is being undertaken by secessionist Sikh groups in Europe and North America at the instance of Pakistan's ISI to revive terrorism in Punjab. 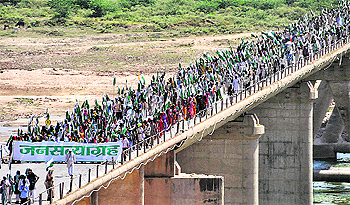 Intense protests over release of water to Tamil Nadu continued to sweep Cauvery river basin areas for the eighth day as Karnataka hoped for a "positive response" from the Supreme Court tomorrow on its plea for reconsideration of the September 28 order. The Congress has probably decided not to take a stand on the Telangana issue even as leaders from the region continue to insist that it is a matter of time before an announcement is made. Escalating its agitation for pay raise and other demands, the Bihar Policemen’s Association (BPA) today launched a signature campaign for over 65,000 constables to go on five days' mass leave from October 10. The Central Board of Secondary Education will conduct the Central Teacher Eligibility Test (CTET 2012) on November 18 throughout the country and abroad. Andhra Pradesh is set to witness the rise of another “son” on its political horizon. Former Chief Minister and Telugu Desam Party (TDP) president N Chandrababu Naidu’s industrialist-son N Lokesh has emerged as the cynosure of all eyes during the ongoing marathon padayatra of his father. Lok Sabha Speaker Meira Kumar went out of her way to extend Indian courtesy to 13 women Speakers and a Deputy Speaker from across the world, who had congregated in the Capital to discuss strategies to make parliaments gender-sensitive. The issue of one-time spectrum fee to be charged from the incumbent telecom operators could be decided when the Empowered Group of Ministers (EGoM) on spectrum, headed by Finance Minister P Chidambaram, meets tomorrow. Modifying the definition of the term “ex-serviceman”, the Central government has brought more categories of ex-defence personnel under its ambit who would be eligible for post-release reemployment in government establishments. These rules were last amended in March 1986. The Army is opposing implementation of 25 per cent reservation for children of weaker and disadvantaged groups in its around 150 schools under the Right to Education (RTE) Act, saying it will hamper the educational prospects of wards of its own personnel. Less than two weeks after Maharashtra Deputy Chief Minister Ajit Pawar resigned from the government to protest Chief Minister Prithviraj Chavan's decision to issue a White Paper on the state's irrigation department, the latter has intensified the clean up operation against this department. Russian President Vladimir Putin may have postponed his much-anticipated visit to Pakistan at the last minute but he is set to keep his date with New Delhi early November for the annual India-Russia Summit. The government and the party will jointly share a platform in the Capital on November 4, explaining to the people the benefits the country stands to accrue from the latest steps taken to reignite the reforms process. This follows a series of small-group meetings with farmers and other stakeholders over the past one week. The Congress had announced plans to hold a rally at the historic Ram Lila grounds with party president Sonia Gandhi and Prime Minister Manmohan Singh scheduled to address people in the presence of Chief Ministers and leaders of various states. Initially planned for October 28, the rally was deferred by a week. Besides seeking to share the perspective of the party and the government on how people will stand to gain from the FDI in multi-brand retail and other measures, the rally aims at sending a strong signal of unanimity within the Congress on the necessity of these measures. The Congress strategy is twin-pronged i.e. reach out to the people and convince the Opposition, especially the Bharatiya Janata Party, the need for such reforms. While the government steps have been interpreted as an attempt to alter its “policy paralysis” image, a senior member of the party said for the past few weeks, an impending acute economic crisis was staring the government. This would have led to a slowdown in spending and a cut in the budgetary support. Over the past few months, the issue of impending grim economic scenario in the country was being discussed informally in the higher echelons of the Congress. “The economic situation was going down and we would have been in a bigger mess unless corrective actions were taken immediately,” a party source said. After a series of informal consultations among senior leaders, the timing of the action was left to the government. That it yielded results is evident from spike in stock markets indices and appreciation of the rupee against the US dollar. A senior leader points out that not many realise that every time the rupee appreciates by one, the country saves around Rs 8,000 crore. So if the dollar is down to Rs 51 as against Rs 57 five months ago, the country saves Rs 48,000 crore simply on account of the dollar-rupee difference. On the prospects of early elections, top leaders in the party are of the view that barring the Trinamool Congress and the Samajwadi Party, no other party in Parliament wants snap polls. Arvind Kejriwal, however, said Congress president Sonia Gandhi’s son-in-law should respond to the specific issues instead of questioning the motive. “I am a private law-abiding citizen who has been engaged in business over the past 21 years. The allegations levelled against me by Kejriwal and (Prashant) Bhushan are utterly false, entirely baseless and defamatory,” Vadra said in a statement. Vadra said he was “saddened” by the attempt to “deliberately misrepresent numbers contained in my financial statements, manufacture lies against me and malign me and my family in order to gain cheap publicity for themselves and for the launch of their political party”. The 43-year-old entrepreneur was responding to Team Kejriwal’s allegations that he had accepted unsecured loans and property at throwaway prices from realty major DLF, which in return got favours from Congress-ruled states of Haryana, Delhi and Rajasthan. The Delhi Government has already denied the charge, so has the DLF, stating that it had not given him unsecured loans as a quid pro quo for favours from the government and that its business dealings with him were transparent and genuine. “My business transactions are fully reflected in the financial statements filed before appropriate government authorities in compliance with the law. 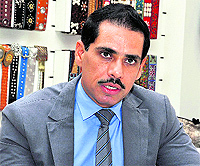 They are available in the public domain to anyone interested in knowing the truth,” Vadra said in the statement today. The DLF on Saturday clarified that it had given Rs 65 crore as "business advances" and got back Rs 15 crore, while Rs 50 crore was used for the purchase of a piece of land. BJP leader Mukhtar Abbas Naqvi said all those involved in the controversy should give concrete clarifications. Party spokesman Prakash Javadekar said there was a need to order a probe into Kejriwal's allegations. There is no militancy in Punjab, claim senior officials in the state and at the Centre. “We are worried over this talk of revival of militancy (in media debates and statements etc),” said a senior official at the Centre. “Yes, there are elements based abroad who are interested in stoking the dying embers,” they add. This talk of “revival of militancy” is hurting the business prospects of the state which is still recovering from the slowdown caused by militancy in 1980s. Countries like Germany, Belgium, the USA, the UK and Canada have been sensitised about the Pro-Khalistan groupings emerging in their countries and they have started cooperating in information exchange-a huge change over the 1980s, senior officials in the state machinery say. The Centre, on its part, wants the state machinery and the political parties in Punjab not to lend any credence to symbols of the past like the upcoming memorial to mark the 1984 Operation Bluestar at Golden Temple. Former militants or their sympathisers occupy some posts in the Akali Dal and also in the Punjab Congress, these tendencies need to be curbed. The act of the state government in batting for clemency for Balwant Singh Rajoana, a convict in the assassination of former Chief Minister Beant Singh, had shocked the Central agencies earlier this year. The Intelligence Bureau (IB) has been tasked to review the security of Lt Gen KS Brar, who was attacked in London by four men last Sunday. Lt Gen Brar believes the attackers were pro-Khalistan radicals and the bid was to assassinate him. The IB is assessing threat perception to Army and police officers involved in the Operation Bluestar. They include three former DGPs of the state - Julio Riberio and SS Virk (Maharashtra cadre) and KPS Gill (Assam cadre). Lt Gen Brar has accused the ruling Akali Dal of condoning acts of terrorism and even alleged that the state was hurtling towards the situation that prevailed during 1980s. Harcharan Bains, Media Adviser (National Affairs) to Punjab Chief Minister Parkash Singh Badal, has countered this by saying: “There is no revival of militancy in Punjab. No incident of violence has occurred in the state, still accusations are being hurled at us.” The incident of Lt Gen Brar is a lapse on part of the Central agencies and not Punjab, he said. He would soon address the national media on the issue, he added. On its part, the Centre is in touch with the state government as regards elements who could possibly be looking to shatter peace in Punjab. Real-time information is being exchanged with the state and a cell monitors information coming in from Europe-based officials of the Research and Analysis Wing (RAW), besides agencies of friendly countries. At the DGPs’ conference in Delhi last month, Chief of Intelligence Bureau Nehchal Sandhu also hinted at the external support to terrorist groups focusing on Punjab among other states. Sources in security agencies have informed about the movement of banned Babbar Khalsa International and the Khalistan Commando Force terror groups in Western countries with the aim to radicalise Sikh youth by showing them doctored footage of Operation Bluestar and other propaganda materials. The attack on Lt Gen KS Brar (retd) who led Operation Bluestar and disruption of Indian Independence Day celebrations in London this year were also the results of such activities of anti-India elements, sources said. They said overground workers of these terror groups were targeting Sikh youths born and brought up in the United States, Canada, the United Kingdom, France, Germany and Belgium. Besides the BKI and the KCF, radical groups like the Dal Khalsa and the International Sikh Youth Federation were also working to radicalise the youth, they alleged. Sources said in the name of fighting the cause of Khalistan, funds were being raised from Sikhs settled there and the next generation youth being lured into the ideology of extremist groups. The agitators today continued their hunger-strike in Mandya, the Cauvery heartland, and staged a rasta-roko at Maddur-Gejjalagere, disrupting traffic on the Bangalore-Mysore highway. Processions were taken out in Mysore. 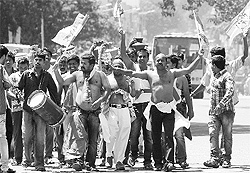 Agitated farmers demonstrated at several places in Mandya and Mysore districts, raising slogans against the Central and Tamil Nadu governments. Chief Minister Jagadish Shettar, accompanied by Law Minister S Suresh Kumar and Water Resources Minister Basavaraja Bommai will hold talks in Delhi with the state's legal team headed by Fali S Nariman. "I am optimistic of a good (favourable) verdict (for Karnataka)", Shettar told reporters during his visits to Hubli-Dharwad and Belgaum in north Karnataka today. He said the state would inform the apex court of the severe drought situation in Karnataka, hardship of farmers and drinking water needs of Bangalore, which depends on the Cauvery, among others.Karnataka has sought stay or modification of the September 28 order which directed it to release 9,000 cusecs daily to the neighbouring state till October 15 as per orders of the Cauvery River Authority, headed by Prime Minister Manmohan Singh. For the Congress, the dilemma continues. Nearly three years after the UPA government announced that the process for the creation of a separate state would be initiated, the issue remains unresolved. Violent protests and counter-protests by those demanding Telangana and those supporting a united Andhra Pradesh continue to haunt the decision-makers. The issue has come to the fore again with Telangana Rashtra Samiti (TRS) chief K Chandrasekhar Rao expressing confidence that a decision would be announced by the Congress-led government by end of the month. Rao, who embarked on a fast-unto-death in 2009 that led to deterioration in the situation leading to the announcement, has been visiting Delhi to build pressure on the Congress and the UPA government to take decision on the issue of carving a separate state. Congress MPs, too, from the region have been pressurising the party to resolve the issue without any delay, while those from he Coastal and Rayalseema regions have a different view. A senior Congress leader told The Tribune last week that the party is acutely aware of the sensitivities of the people of the state and emotions it generates among them -- both for the Telangana and the united Andhra Pradesh factions. Among the concerns likelihood of the return of violence witnessed in the state when the decision was announced. Conceding to the creation of a separate Telangana is also bound to accentuate similar demands from other states, a situation the Centre would best avoid. At present, the Congress is on a weak political turf in Andhra Pradesh. The state has 42 MPs and it played a crucial role in the formation of the Congress-led coalition governments both in 2004 and 2009. After the death of YS Rajasekhara Reddy, the Congress has conceded ground in the Coastal and Rayalseema regions to his son YS Jaganmohan Reddy, who rebelled and formed his own party. On the other hand, Chandrasekhar Rao of the TRS has already gone on record that the party could merge with the Congress only if the demand for the separate statehood is met. The Telugu Desam Party (TDP) finds itself in a difficult situation losing support across the Telangana region and unable to match either the nascent YSR Congress of Jagan Reddy or the Congress in other two regions. Currently, he is undertaking a ‘padayatra’ to gauge public sentiment. The TDP, which steadfastly opposed creation of a separate state when it supported the Atal Behari Vajpayee government, now favours a separate state as does the BJP, which kept the issue on the back burner even though it created Chhattisgarh, Jharkhand and Uttarakhand. The ball is firmly back in the Congress court. The BPA is demanding grade pay of Rs 2,000 on a par with other states, appointment of a havildar over every four constables and an assistant sub-inspector over 12 constables. "We are providing forms to all police constables across the state for their signature in support of mass leave," BPA president Jitendra Kumar Singh said. The association threatened mass leave by the constabulary after talks between the state government and the BPA failed last week. The candidates were required to apply online for the test through the CBSE website from August 1 to 31 and the last date for receipt of confirmation page in CBSE was September 7. Candidates can see the status of their application on the Board’s website www.ctet.nic.in or www.cbse.nic.in. Candidates can make online corrections, if any, in their application in the following particulars -- candidate’s name, father/husband’s and mother name, date of birth, category, differently abled category, subjects for Paper-II, address of correspondence and name of the Institution/ College/ University from where he/she has obtained his/her degree/diploma in education. Lokesh (31), a Stanford management graduate, has been playing an active role in coordinating his father’s ambitious, 2,300 km-long walkathon across the state. The young leader was seen mingling with the party cadre and common public during the padayatra which began at Hindupur in Anantapur district on October 2. The party circles viewed his appearance at the mass contact programme as a signal to his eventual coronation, a move that could trigger a bitter succession battle in the regional party founded by Naidu’s father-in-law and matinée idol of Telugu cinema, late NT Rama Rao. NTR’s actor-son and senior TDP leader N Harikrishna is keen on promoting his son and popular filmstar “Junior NTR” to take over the party reins. However, 63-year-old Naidu, who had served as the Chief Minister for nine years after dethroning his father-in-law in a political coup in 1995, appears to be promoting his son for a larger role in the party ahead of the 2014 Assembly polls. As Naidu embarked on a gruelling 117-day padayatra criss-crossing the state, he is said to have delegated the party coordination work to his son in what is seen as a prelude to handing over the party’s throne to him. Since its inception in 1982 on the plank of “Telugu Pride”, the TDP has been a close-knit, family-driven organisation. Though Lokesh has been refraining from addressing public meetings, preferring to be a backroom strategist, his public appearance at the padayatra has enthused the party cadre. “I am like an ordinary party worker. I will work towards strengthening the party and regaining its past glory,” a shy and reticent Lokesh told the media. According to party sources, Lokesh would now be asked to visit the party headquarters here daily and coordinate the party activities. Meira Kumar gave them all as parting gifts hand-woven pure silk Banarasi Tanchoi sarees, known for their delicate and tiny weaving patterns all over the body of the fabric. The Lok Sabha Speaker also arranged a tailor to ensure that each saree was ready to wear for the visiting Presiding Officers of world parliaments before they attended the lavish dinner hosted by her at a luxurious private hotel here. Interestingly, all the Speakers even had helpers to tie sarees for them on the evening of October 3 and arrived for the dinner in Indian finery. President of the National Council of the Republic of Austria Barbara Prammer looked ravishing in her peach Tanchoi. Speakers of parliaments from Uganda, Tanzania, Zimbabwe and Turkmenistan carried their outfits with ease to the surprise of all other VIP guests, including Cabinet Minister Pawan Bansal. If that was less, the foreign guests had no problems playing ‘dandiya’ in their sarees at a cultural ceremony organised for them in Parliament’s Balayogi Auditorium. The Speakers had for company actor and former MP Hema Malini, who had prepared a special classical dance sequence for the guests. The EGoM could also decide on extending the option of deferred payment to the incumbent operators for making their one-time payment for migrating to a new regime. The EGoM, which had earlier met on October 3, could not decide on the issue of one-time spectrum for existing telecom operators as the legal opinion from the Attorney General (AG) on the matter was not received. The AG has apparently submitted his views to the Department of Telecom (DoT) on Friday, which would make it possible for the EGoM to go ahead with its decision. The AG has apparently said the incumbent operators must pay the auction determined fee for all the excess airwaves they hold beyond the 6.2 MHz limit retrospectively from July 2008. Estimates say that these mobile phone companies will have to jointly shell out about Rs 35,000 crore if the EGoM endorses the AG’s stance during its meeting. The DoT had made four proposals to the Cabinet on one-time fee -- no charge; levy a one-time fee on all airwaves held by existing telecom companies; impose a fee on airwaves held beyond the start-up spectrum of 4.4 MHz; or levy a fee on airwaves held beyond the contracted spectrum of 6.2 MHz. The DoT also added another option of one-time auction-determined price for all spectrum held by the operators to create a level playing field between new entrants and existing players. Existing players were allocated pan-India permits with 4.4 MHz of airwaves frequencies at price of Rs 1,658 crore, but new telecom operators will have to pay a minimum of Rs 14,000 crore for similar set of airwaves for pan-India business in auction that are scheduled to start in November. The EGoM had earlier deferred a decision on the matter till the outcome of Presidential Reference. Now with the Supreme Court's clearing the air with its opinion on the Presidential Reference, the government is now free to take a decision in this regard. Reports have said incumbent service providers will decide on participating in spectrum auction based on the decision taken by the government on one-time spectrum fee. Reports have also said the DoT has informed the EGoM that the deferred payment option should be considered while charging for spectrum from existing licensees. According to the DoT's proposal, the incumbents will have to pay 33 per cent of the amount due for 20 years or full amount due (whichever is less) as the first down payment. A moratorium of two years would be given, if the balance period of the license is greater than 15 years and a moratorium of one year if the balance period is between 10 and 15 years. No moratorium would be allowed if the balance period is less than 10 years. An interest of 9.75 per cent would be charged per annum on the balance amount. The government has already approved a staggered payment option for the telecom players who are going to bag spectrum in the upcoming 2G auction. Orders issued by the Department of Personnel and Training (DOPT), the nodal government agency for notifying such rules for all ministries, on October 4 has also redressed certain anomalies and ambiguities existing in earlier rules that prevented some ex-servicemen from reemployment. Government rules stipulate certain conditions for ex-armed forces personnel to be considered as ex-servicemen. Only those personnel, who fulfilled these conditions, were eligible for post-release benefits, including reemployment in Central or state government agencies. Many persons, who served in the armed forces, were not considered ex-servicemen for several reasons such as the length of their service or the reason for their discharge. The new notification, while covering aspects of all level of posts across Group A, B, C and D, will now also include those armed forces personnel who have been released consequent to the reduction of establishment they were posted to. Significantly, the recruits boarded out from service on account of disability have now been brought under the definition of ex-servicemen. Earlier, the Ministry of Defence had issued a circular stating that such recruits were eligible for ex-servicemen benefits, but many departments were refusing to accept this stating that only the DOPT was competent to define such rules. All gallantry awardees would now be considered ex-servicemen regardless of their length of service or pensionary status. The new rules also cover Territorial Army pensioners of both categories, that is, those who earn pension after continuous service or in broken spells. By specifying and comprehensively explaining the modalities of reservation and adjustment of vacancies vis-a-vis other reserved categories, the new rules have removed the existing ambiguities plaguing post-release reemployment. Similarly, age relaxation for all levels of posts, including that for competitive examinations, has now been clearly specified. A letter in this regard has been sent to the Defence Ministry by the Army Headquarters, Army sources said here. The 1.3 million-strong force runs around 150 schools across the cantonments in the country. The stand in this regard was taken some time ago and the government has been apprised about the reasons behind it, the sources said. This position has been taken in view of the Right of Children to Free and Compulsory Education Act, 2009, which makes it compulsory for every private unaided school to admit at least 25 per cent in its entry-level class children belonging to weaker and disadvantaged groups. State government sources confirmed that Chavan has ordered a probe against 45 officials of the Vidarbha Irrigation Development Corporation (VIDC) from where serious irregularities in clearing projects have been reported. An inquiry committee appointed to probe allegations against officials here had recommended that they be investigated. The committee's report was under the consideration of the government for more than two years. Among those under the scanner include former CEO of the corporation D P Shirke. All these officials have been accused of allowing contractors to jack up project costs which resulted in huge losses to the state exchequer. Sources say, many of the officials were acting on the orders of Ajit Pawar and his successor Sunil Tatkare who is presently irrigation minister. Shirke is accused of bypassing normal procedure to clear claims made by contractors, according to sources. In the run-up to Putin’s visit, Russian Defence Minister Anatoly Serdyukov will be in New Delhi next week for a meeting of the India-Russia Inter Governmental Commission on Military Technical Cooperation (IRIGCMTC). This will be followed by Russian Deputy Prime Minister Dmitry Rogozin’s visit in mid-October for a meeting of the India-Russia Inter-Governmental Commission (IRIGC) on trade, economic, scientific, technical and cultural cooperation. Rogozin will also do the groundwork for Putin’s first visit to India in his third presidential term, diplomatic sources said. Pakistan will obviously feel left out when Putin visits New Delhi. In recent years, Pakistan has been making attempts to mend fences with Russia and, therefore, it was quite keen on hosting the Russian President, who was scheduled to attend a quadrilateral summit of Pakistan, Russia, Afghanistan and Tajikistan on October 3. But Russian Foreign Minister Sergey Lavrov visited Islamabad earlier this week and reassured Islamabad that Putin’s visit was being rescheduled. Pakistan Army Chief Gen Ashfaq Pervez Kayani was in Moscow, amid media reports that Pakistan was keen on enhancing defence cooperation with Russia. Indian and Russian officials are in touch discussing the agreements to be concluded after talks between the Russian President and Prime Minister Manmohan Singh. On top of the agenda will be fast-tracking the civil nuclear cooperation. Russia is hopeful that the signing of an accord between the two countries on Kudankulam-III and IV units may emerge as the biggest takeaway from Putin’s visit. Moscow also expects that by the time the Russian President arrives in India, the protests against Kudankulam-I and II units will end. The two countries are also seeking to resolve their differences over India’s civil nuclear law, particularly on the liability clause. Russia says the new law should not apply to Kudankulam-III and IV units since an understanding on setting up these plants had been reached much before the Indian law was passed. But India says it can’t make any distinction between Russia and its other partners in the field of nuclear energy. The argument being advanced by New Delhi is that any exception made in the case of Russia will spur the US and France to seek a similar exemption. Russia is also likely to seek an end to the stalemate over the Russian telecom giant Sistema’s $ 3-billion investment in a joint venture in India following the Supreme Court’s order cancelling all 122 telecom licences because of bribery allegations. The time-tested defence relationship will also come up for discussions between the two sides with India keen on an early conclusion of the deal for the fifth generation fighter aircraft. The Navy, in continuation of its trials, today successfully test-fired the missile, capable of carrying a conventional warhead of 300 kg. It was test-fired from warship INS Teg - the Navy's latest induction from Russia - off the coast of Goa early this morning. The missile successfully hit the target ship. Two other warships - INS Tarkash and INS Trikand, both Talwar-class frigates like the INS Teg - will also be armed with the missile in vertical launch mode. “The Navy has also got a number of indigenous ships coming up. Project 15 Alpha (INS Chennai) has already been inducted. Now 15 Bravo and 17 Alpha (destroyers with stealth features) are getting ready. The BrahMos missile is going to be the most effective weapon for the Navy”, the official said. The missile has already been inducted into the Army and the Navy. While the induction of the first version of Brahmos missile system in the Navy started from 2005 with INS Rajput, it is now fully operational with two regiments of the Army. The Air Force version of the missile is also said to be ready and work is going on to modify two Russian Sukhoi (Su-30) fighter jets to make the aircraft BrahMos compatible. The official said to enable the Su-30 to carry the heavy BrahMos, the missile carrying points of the aircraft were needed to be relocated for which the airframe would have to undergo change. “It will have to be done structurally”, he said. The IAF made available two Su-30 fighter jets to the HAL for the tests, the official said, adding that the plan was to have one squadron (20 planes) of Sukhois armed with the BrahMos. The missiles would be used to engage stationary targets in the enemy territory, he said. However, the French Raphel fighters, chosen by the IAF to act as a medium multi-role combat aircraft (MMRCA), or the indigenous light combat aircraft Tejas (which is yet to be inducted in the IAF) would not be able to carry the BrahMos because of its weight. Once a regular figure on television news channels, former Congress spokesperson Jayanti Natarajan literally went underground after she was appointed Environment Minister. The otherwise media-friendly Natarajan turned her back on press persons as they suddenly found it impossible to meet her. It was, therefore, quite a surprise when she resurfaced on chat shows last week to vigorously defend the charges levelled by activist-turned-politician Arvind Kejriwal against Congress president Sonia Gandhi’s son-in-law Robert Vadra. The Congress had initially decided to ignore the allegations on the ground that these pertained to a private citizen. However, it changed its strategy when it realised that Sonia Gandhi was being dragged into this controversy. It promptly marshalled its forces. All party spokespersons were put on the job while Union ministers were also roped in to rebut these charges. Although Salman Khurshid and Rajeev Shukla were fielded as usual, the party felt the need to supplement their efforts by bringing in Jayanti Natarajan, probably because she can be depended upon to argue its case quite forcefully. The Haryana coordination committee constituted by Congress president Sonia Gandhi over a year ago was meant to be a forum where the state’s MPs and other leaders could take up ticklish pending issues with Chief Minister Bhupinder Singh Hooda. But this panel has turned out to be a virtual non-starter. Hooda had no answers when he was at the receiving end at the committee's meeting last week. His colleague and Power Minister Ajay Yadav complained that his demand for setting up of a university in his district had been ignored while Hooda’s home district Rohtak was being pampered. Details were also sought about the allocation of state development funds as most leaders present pointed out angrily that their constituencies were being deliberately bypassed in favour of others. An unusually subdued Hooda promised to get back with these details at the next meeting but his colleagues were not convinced, considering the committee met last week after a gap of one year and three months. Having declared his intention to contest the 2014 Lok Sabha polls from his hometown Nagpur, BJP president Nitin Gadkari has got down to the task of nursing his constituency. Although he has an advantage because he’s from the city, Gadkari is not taking any chances. His vast business empire has been put on the job of wooing the electorate. Gadkari’s company went into an overdrive during the festive season as it generously supported and sponsored the various pujas and pandals during the recently-concluded Ganesh Chaturthi festivities. The BJP chief is also giving special attention to the Muslim population that is known to have a strong antipathy towards the saffron party. Gadkari’s company has been busy doling out loans to Muslim youths for the purchase of trucks that are then deployed by it to transport its goods. Gadkari’s activities are naturally worrying his political opponent, Vilas Muttemwar, seven-term Congress MP from Nagpur, who is understandably not his old cheerful self these days.